I was convinced They Hunger would hold together about as well as a skeleton in a hurricane. Not only is it a 20-year-old Half-Life mod. It’s a 20-year-old zombie Half-Life mod. Given how gaming scraped the bottom of that brain cavity seven or eight years ago, I struggled to see how They Hunger could shine through two decades’ worth of derivative undead-fests. Less than two hours in, They Hunger had proved me wrong. I realised this after it tried to crush me between two zombie-driven trains, then let me drive one of those trains through a sequence of tunnels filled with walking corpses. I’m not sure what the best way to rekindle an old friendship is, but I think shouting “Choo-choo motherfuckers!” as you splatter a shambling horde with your cowcatcher is pretty hard to beat. Released in three parts between 1999 and 2001, They Hunger is a singleplayer, story-focussed total conversion for Half-Life. Created by a team of modders led by Neil Menke, it charts a zombie outbreak in the fictional town of Rockwell, which you’re thrown right into the middle of after your car falls into a lake after being struck by lightning. 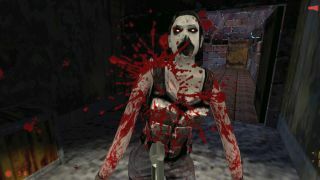 Unlike mods such as Counter- Strike, which used Half-Life’s tech to create a very different experience, They Hunger follows the design ideas of Valve’s seminal shooter closely. It tells a linear story using environmental storytelling and scripted setpieces, with levels built to convey a coherent, believable world. Even most of its weapons and enemies are reskins of those used in Half-Life. The crowbar, for example, becomes a lethal umbrella. John Steed would be proud. What made They Hunger stand out, and what makes it stand out today, is how the quality of its level and setpiece design rivals that of the game it’s based upon. The mod starts out with an indulgent cutscene that includes a radio report discussing “atmospheric disturbances”, followed by long shots of your car’s fateful journey into a ravine. Once you escape the water, you must cut through a churchyard where zombies burst out of coffins, before navigating a pumping station and an unstable volcanic crater as you attempt to reach the site of that broadcast. Chapters two and three are more ambitious still. The second episode has you escape from an infested police station, before making your way to a sprawling mental asylum where the source of the outbreak is located. Inside, you descend into a secret underground laboratory, before escaping in a lengthy scripted sequence wherein the asylum slowly and brilliantly burns to the ground. As you’d expect given its heritage, They Hunger is a whip-smart shooter. But it also stands up as a horror game. Like Looking Glass’ Thief, the dark and cloying atmosphere is aided by its lumpen lo-fi graphics, while the sound design is suitably eerie. The way its scuttling skeletons (which are reskinned vortigaunts) whisper “flesh creature” before they attack is profoundly unsettling. While creepy, they Hunger knows how to balance its horror with more lighthearted moments. The third chapter commences with a tense sequence in a hospital, followed by a more tongue-in-cheek section in which you battle through a farmyard populated by zombie animals. As I said, They Hunger works fine visually, but if you struggle with its default presentation, help is at hand. The mod is so old now that it has its own suite of mods, most of which are dedicated to improving the visuals. The two main mods of interest are They Hunger-Remod by Zikshadow, which makes updates to most of the game’s character models, and My Weapons Pack, which improves the models on weapons and your character’s hands. Together they help fend off some of the ravages of time. Getting They Hunger up and running today isn’t too challenging. There are several versions on ModDB which are compatible with Steam. Completing it is a little trickier. I encountered several points where the mod would crash to menu or crash to desktop. Some of these appeared to be caused by certain enemy sound effects and could be bypassed with a little luck. Others were linked to broken script triggers, and could only be avoided by noclipping through the map to the end of that area. Having to resort to workarounds is not ideal, but it’s worth it to experience a brilliant zombie adventure. They Hunger crams more inventiveness into its campaign than most bona fide zombie games, while balancing silliness with tension well. It may look a little desiccated and moan when it gets up, but there’s life in They Hunger yet.